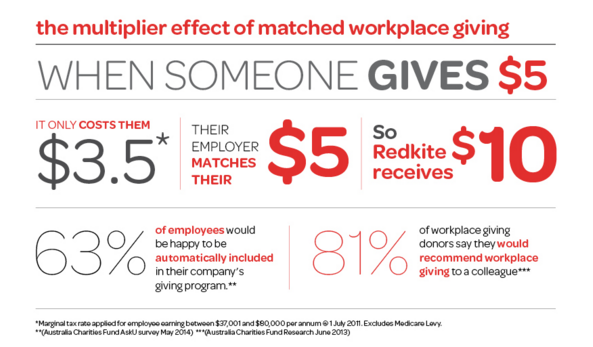 According to Redkite CEO, Jenni Seton, Workplace Giving Month, which is held every June, is a great opportunity to renew the passion and enthusiasm of your corporate partners. Each year, Redkite – an Australian cancer charity providing essential support to children and young people (0–24 years) with cancer, and their families and the people who care for them – tailors its Workplace Giving approach to suit key partners. During a recent Workplace Giving Month, existing partners were given a ‘Workplace Giving Month Toolkit’ to help inspire and engage their teams; new corporate partners were emailed The Australian Charities Fund video “How to Implement WPG”; and almost 5,000 people were reached with information through Facebook, LinkedIn and banner ads on the Redkite website. Jenni is pleased to report that after a very difficult cancer experience, Claire is now cancer free and is pursuing her dreams to be a pastry chef, again with Redkite’s support.